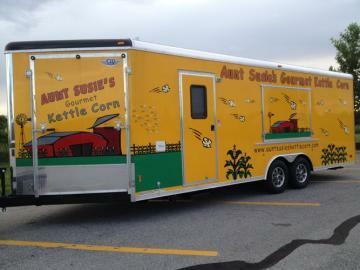 Aunt Susie’s Gourmet Kettle Company, LLC turned from a dream to reality in 2011. We officially starting popping our famous kettle corn on February 1, 2012. We started out as a mobile tent unit, where you could find our red tent at Sam’s Club in Bentonville and Fayetteville, Northwest Arkansas Craft Fair in Rogers at the Frisco Mall, Parson’s Arena and multiple other fundraising events. Thanks to our wonderful customers, we expanded into a 30 foot yellow trailer. As we are still a mobile unit, we can be found at many locations throughout Northwest Arkansas. We can make an appearance at any outdoor activity or fundraiser, such as fairs, festivals or other scheduled events. We are at the Parson’s Arena events including Monster Truck, Demolition Derby, Rodeo of the Ozarks and PBR. During the spring and fall NWA craft fairs we are at the Frisco Mall in Rogers and on Saturday morning we are at the Downtown Rogers Farmers Market. The Junk Ranch in Prairie Grove has fun events twice a year and a similar event is The Chicken Ranch Vintage Market in Jones, Oklahoma. In the fall, we are at McGarrah Pumpkin Patch in Pea Ridge followed by The Stewart Family Christmas Lighting Display in Fayetteville. I was lucky enough to get some more of this awesome popcorn. It's really the best. We enjoyed the cheese flavor and the kettle corn. This isn't your average popcorn. When visiting with Susan Call the owner I was very surprised to learn the research she has done to provide the highest quality kernels. Orville doesn't have anything on this lady's popcorn. Take my word for it this is where to get your popcorn!!!!! !